From comic strip to bowling alley. 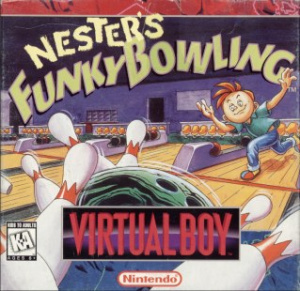 After a few years' absence (spent as a struggling actor according to the instruction booklet) former Nintendo Power comic strip star Nester returned in this bowling game, featuring three modes of play and some “funky” animations. 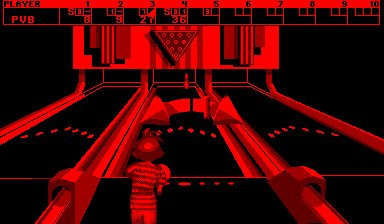 Before the Wiimote provided a natural way to play bowling, video games had to find an alternative way to simulate playing the sport. From Championship Bowling on the NES to the mini-game found on the Gamecube’s Super Monkey Ball, the method was always fairly similar and Nester’s Funky Bowling is no different. After positioning your character a meter appears, swinging back and forth. This is where you aim to add any spin you may require. Next up is the power meter, determining the force behind your throw. The rules are simple, ten frames to knock down as many pins as possible with extra points awarded for strikes and spares. Get a strike or spare in the final frame for an extra ball. Before you start you can select from three music tracks or you can opt to play without. The three tracks are different, though unremarkable. They do provide some much needed background noise however as with the absence of offscreen chatter or sound from other games, playing without music is a very eerie experience. Next you can enter your name (limited to four characters) and select if you want to play as Nester or his twin sister, Hester. This has no effect on the game other than each character has different reaction animations. What does affect things is the weight of the ball used and you can choose from weights ranging from 8-16 pounds. 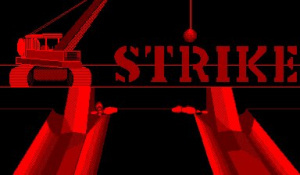 This being a Virtual Boy game, gameplay is in 3D. It looks impressive with the lane stretching out in front of you but it doesn’t seem quite long enough. Your character is unanimated when you are positioning them, but the sprite bobs up and down so they at least seem to shuffle, rather than slide, into place. After the ball has been thrown and travelled part way down the lane, the screen splits in two. The bottom half shows a close-up of the pins and the top shows your character and their response once the pins have fallen. Nester tends to get angry; Hester gets angry too, but also possesses a few disappointed looks. There are quite a few funny reactions from the pair including pulling at hair, steam coming out of their ears, yelling and getting crushed by a giant pin. Occasionally you will see them celebrate but upon getting a strike or a spare you are often treated to a different animation such as a strike in a baseball game or a spare tyre falling from the back of a vehicle. Additional animations also appear for splits and misses, the later featuring a smug-looking pin hopping out of the way. Amusingly, one of the other animations in the game sees him flattened. 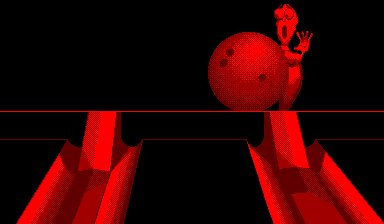 Sound effects are the simple rolling and crashing noises you’d expect from a bowling game but there are also some speech samples which often (though not always) announce misses, splits and the far more pleasing occurrences such as spares and strikes. 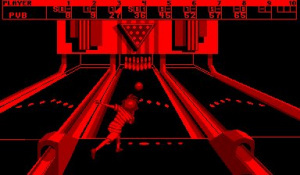 Aside from the normal game of bowling there are also practice and challenge modes available. Practice is self-explanatory, though rather than just limit you to set pin arrangements you can also set them up however you like. Challenge presents you with ten computer generated shots, rewarding you with points should you manage them. These modes should keep you interested in the game for a while but it’s unfortunate that it doesn’t include computer-controlled opponents to compete against or some sort of tournament. The presence of a scoreboard does give you something to aim for but as the game does not feature a save option, should you make it onto the board this information will be lost as soon as you turn your machine off. This is disappointing but luckily Nester’s has something to make up for it: a 2-player option. No link cable required, just two people and the one system. Available in all three modes (though 2-player practice is pretty pointless) it obviously adds a great deal of replayability to the game. There is one problem though: IPD adjustment. Following the precautions screen the first thing you are presented with in any Virtual Boy game is the “IPD and Focus adjustment screen” where the system is adjusted for the eyes of the individual user. It’s unlikely that two players will require it to be set exactly the same and so a 2-player game will probably see each player bringing up the screen between frames (done by pressing select) and having to make adjustments for their turn. This adds extra time to a game but it’s better with the 2-player option than without. 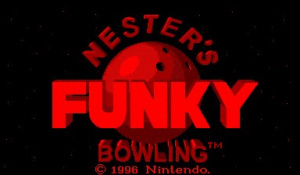 Nester’s Funky Bowling is a decent bowling game with amusing animations making it fun to play. It could have used some more game modes, and the lack of a save function for high scores is disappointing. However it is saved by the welcome (if somewhat fiddly) inclusion of a 2 player mode. Hmmmm, I might have to give this one a try. Nice review! whats with all the VB reviews, does anyone actually own one of these? I've got a Virtual Boy, although I don't play it much anymore. Interesting little system. I have one. It's a Nintendo machine, this is a Nintendo site. i've always wanted to have a go on one. they go for £200+ on ebay... too much for something i'd probably play for a couple of hours. I was in america when the first TV ads aired, got so excited! Probably would have been a success if it was in colour or smaller and marketed as handheld. £200+? Not quite. You can pick up a second hand boxed machine for far less than that. I have a Virtual Boy too, with all 14 games! It's a pity that people had nausea playing the VB, I vastly enjoy mine without issues, other than the fact I needed to buy a power converter since it was never released in Australia. Hell yeah, I had this one back in the day. Just recently sold it on ebay though. This is one of my favorite bowling games...err well from what i've played.